Canine Physical Therapy for Dogs and companion animals. Physical therapy, with the focus on animals, is the treatment of an injury, illness, or post-surgical care for dogs/pets to decrease pain and restore function and mobility. 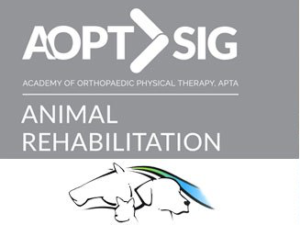 Pet physical therapy is an extremely important aspect of treatment in veterinary medicine to ensure the best care and greatest possible outcome, especially for musculoskeletal and neurological conditions. In canine physical therapy, we look at the entire animal, focusing not only on the obvious problem, but the compensatory issues that develop as a result of the initial problem. 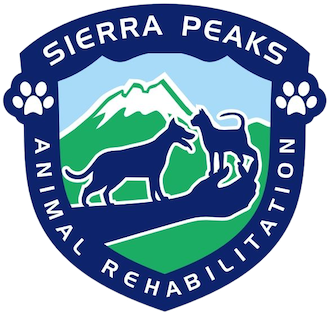 The owner, pet and physical therapists will form a dynamic team engaged in improving the quality of life of the pet and keep them fit, active, and pain-free. A full comprehensive evaluation with musculoskeletal and neurological assessment. This is a technique that was adopted from human physical therapy where joints are mobilized in specific ways to restore range of motion and function. By distracting and compressing the joints, joint fluid is actually redistributed over the joint surfaces to aid in lubrication and gliding of the joint. A restricted joint will decrease an animal’s normal movements, making them more susceptible to injury. Passive and active exercises and activities are performed to improve functional mobility and strength in our patients. 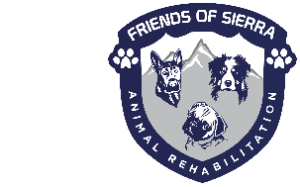 A specific program of these exercises and activities will be prepared for your pets’ individual needs. Owners are instructed how to engage their pet in performing said exercises and activities as a part of the home exercise plan. As your pet progresses, they are re-evaluated, and exercises and activities are modified to accomplish new goals and achieve a higher level of function. Cold laser therapy is a noninvasive procedure that uses light to stimulate cell regeneration, increase blood circulation and promote healing. Cold laser therapy can treat acute and chronic injuries, sprains and strains, arthritis, swelling due to back disc problems, and muscular-skeletal abnormalities. It also helps to promote healing of tissues after surgery or injury. We use a temperature controlled underwater treadmill for patients who can benefit from low-impact exercise or help gain mobility and motor function in patients with neurological conditions. Overweight and post-surgical patients can gain strength and movement using the buoyancy and resistance of the water. The underwater treadmill is much more precise and controlled than open water swimming in which a patient can do more harm by the erratic movements used when swimming. Patients seem to feel more comfortable in the underwater treadmill with their owners close by, cheering them on. This technique uses a low-level current that facilitates a muscle contraction and helps to decrease swelling. It is very beneficial for neurological and orthopedic patients to prevent or treat muscle wasting due to disuse. NMES also aids in controlling muscle spasms and in decreasing pain. Ultrasound is a safe and effective method of stimulating the tissue beneath the skin’s surface using high-frequency sound waves. Some conditions where therapeutic ultrasound is used are muscle spasms, chronic inflammation, restricted range of motion, and musculoskeletal pain. It can also be frequently used for wound healing. Ultrasound has both thermal and non-thermal effects. When it is used to warm the tissue it can decrease both muscle spasms and pain. Some non-thermal uses include wound healing.